EVELETH HERITAGE COMMITTEE - Eveleth Heritage Committee—Welcome to Eveleth! Explore Eveleth's fascinating history with us! The Eveleth Heritage Committee created this new website to share the fascinating history of our beloved community. We hope you enjoy the stories and photos. Click here to learn more about our organization and how you can help us preserve and share Eveleth history. Please check back soon, as we try to continuously add more pictures and information. ​​Eveleth began with log cabins in a mining camp built in 1892. The village was platted in April 1893, and the first elections were held the following year. As Eveleth grew, the village built sidewalks, schools, a water works, an electric light system, businesses, and homes. To accommodate mining activity, nearly all of the buildings in town were moved up the hill at the turn of the 20th century. Eveleth was incorporated as a city in 1902 and continued to grow, eventually reaching a peak population of 7,484 in 1930. At one time, seven school buildings, three movie theaters, three banks, ten churches, two railroads, two newspapers, two hospitals, and numerous restaurants, stores, and other businesses all served the city concurrently. Dozens of ethnic groups have made Eveleth their home in the past 125 years. Eveleth has always been known for great hockey players and became home to the United States Hockey Hall of Fame in 1973. The world's largest hockey stick is located downtown, and the Eveleth Hippodrome is a landmark arena in Minnesota. The Thunderbird Mine opened in 1965 and is still the largest employer in town. U.S. Senator Paul Wellstone died in a plane crash south of Eveleth in 2002, and the 2005 film North Country, inspired the Jenson v. Eveleth Taconite Co. court case, was partially filmed here. 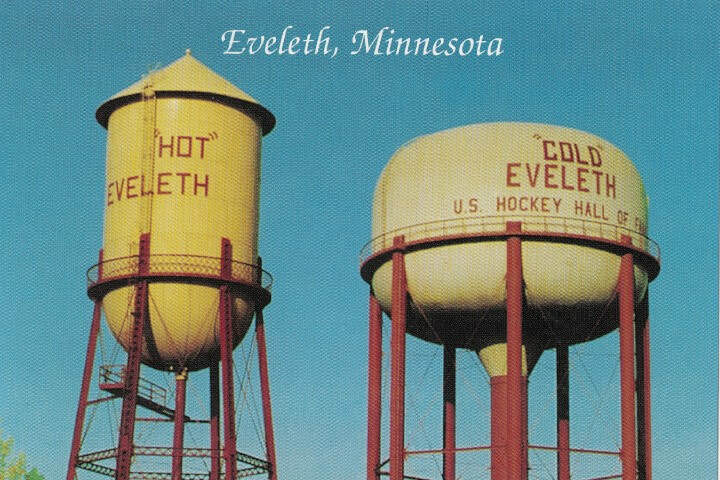 Do you remember when Eveleth had two water towers? We have a piece of the old one! We're asking the public for suggestions on how and where to display it for all to enjoy. Contact us with your suggestions! 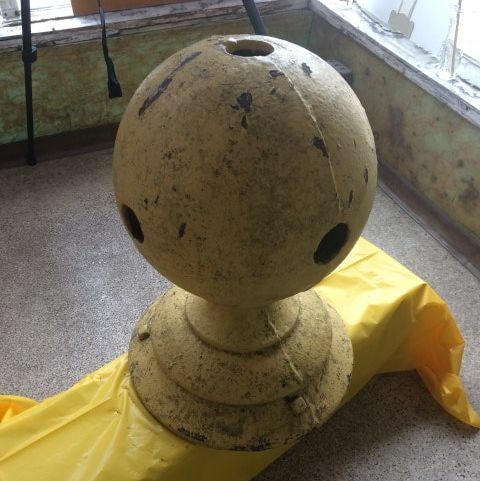 This metal ball once sat atop the water tower labeled "HOT." The Heritage Committee is seeking funding to digitize historical Eveleth newspapers up to 1922, and even further depending on copyright laws. Newspapers are an invaluable research tool, and digitization helps preserve the information and makes it accessible to anyone with internet access. Please consider making a donation to support this project!